In July 2017, more than 50 employees of Three Square Market, a vending-solutions company located in River Falls, Wisconsin, voluntarily implanted microchips underneath their skin. In an interview with CNBC, Three Square Market’s CEO, Todd Westby, explained that “It is really convenient having the chip in your hand with all the things it can do.” The radio-frequency-identification (RFID) microchips allow employees to open building doors, pay for vending machine snacks, and log onto their company computers. The grain-sized chips are implanted between the thumb and the forefinger and are equipped with NFC or near-field communication capabilities that allow employees to access things with a swipe of their hand. The Wisconsin-based company made media headlines when they announced the controversial practice because they were the first company to mass implant their employees in the entire world. However, the technology itself has been around for decades. Many pet owners microchip their dogs or cats in the event they escape or get lost in the neighborhood. Animal control or shelters use special scanners to identify the pet and its owner’s identity to ensure the pet is returned safely. Other applications that use RFID capabilities include Apple Pay and Google Pay, which allow you to buy goods with just your smartphone, and RFID ear tags, which allow farmers to keep an inventory of their livestock. RFID technology is becoming a staple in the American and global workplace. The technology can transform complicated and costly methods into convenient and affordable solutions. Yet there seems to be a vast majority of people who think implantable microchips will bring serious medical, ethical, and legal consequences. According to a 2008 study, it is still uncertain whether RFID implants may cause cancer in humans. The study found that the probability of getting cancer is very low for humans and insignificant for animals. For some, the reward is greater than the risk, but for most people, the risks associated with implantable chips are not worth the convenience. 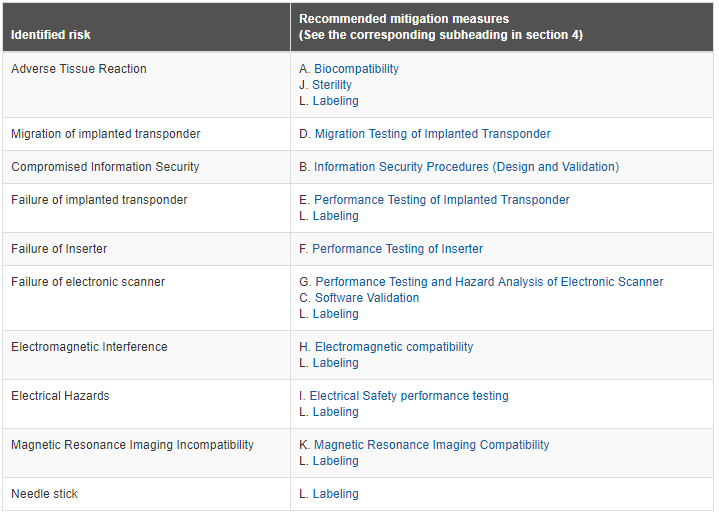 Although the method of implantation is quick and relatively painless, the FDA points out some potential risks associated with Implantable Radiofrequency Transponder Systems. At first glance, the risk would certainly make most people nervous. Through my observations, humans tend to be risk-averse to products that can seriously affect their health even if the risk is minor. The study found that there would be a very low social acceptance rate for RFID implants in the medical field especially relating to identification technology. If we look at the opposing spectrum, medical care providers see RFID technology as a useful solution for many applications. Medical companies can use this technology to access people’s medical information during visits, track vital signs such as heartbeats, and monitor patients with diabetes. We already see tech companies beginning to add health features to their products like the Apple Watch, which is able to monitor your heartbeat and perform EKG scanning. There is also a broader fear that RFID microchips will be used to track humans via GPS without their awareness. Privacy ranks as one of the most important topics in today’s political climate ever since the NSA was famously exposed by the exiled whistleblower, Edward Snowden. In a world where it seems nearly impossible to live day-by-day without a smartphone or computer, privacy laws will play a crucial role in stopping technology misuse. Currently, there are only five states that prohibit mandatory implantation of an RFID microchip, one of them being Wisconsin, where Three Square Market is headquartered. Legislation focused on technology rather than actions provides a formula for political tension. The technology cycle is never ending, and sooner or later, we will see RFID implants in our workplaces and daily lives. Will the RFID implants make life more convenient? Sure. Will it make people healthier? Probably so. Will citizens be safer? More than likely. Just like any innovative technology in our existence, we will question the intended uses, debate the advantages and disadvantages, and raise concerns over privacy. The new technology will become so widespread and regulated that people may have no choice but to conform. Take for example the smartphone boom since 2008. Ultimately, lawmakers will decide the fate of implantable microchips. Ethical or unethical, the concerns will grow, and we will ask ourselves how far we are willing to go for personal convenience. Bart Grabowski is the Sales and Marketing Manager at Sigenics, Inc. Contact Bart at (312) 448-8000 or by emailing at bart@sigenics.com. Sigenics, Inc. is a full turnkey ASIC supplier. We specialize in designing, manufacturing, testing and supplying “private label” electronic and microelectronic devices for the Aerospace, Medical, Military, Industrial, and Obsolete Parts markets. Sigenics offers full turnkey services to deliver manufactured product, starting from a client’s concept.